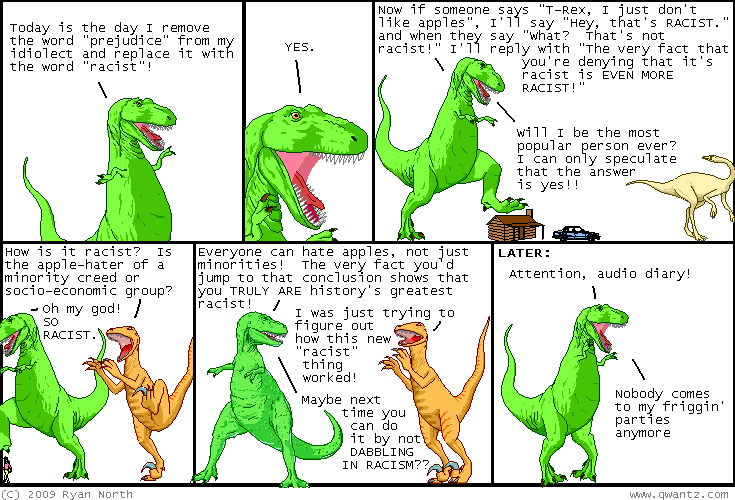 Dinosaur Comics - April 7th, 2009 - awesome fun times! April 7th, 2009: What am I up to this week? Oh my goodness, SO MANY THINGS. Tuesday night I'll be speaking at Graphically Speaking, as part of the Keep Toronto Reading event! I'll be there with a bunch of other talented people, including my friends Emily and Katy. WE WILL TALK ABOUT COMICS AND IT WILL BE GOOD TIMES! This is Tuesday night at the North York Central Library at 6:30. You should come! Then, the same night, we'll be running over to 6 Nassau Street in Kensington Market for the Overqualified Book Launch where Joey will be reading from his new book, and also Emily and Katy and I will also read some too and that will be fun times! You should come! Then I'll be driving down for the Titans of Small Town gallery show with Chris and Chris, which will be Saturday the 11th in Brooklyn. You should come! One year ago today: william shakespeare: "now cracks a noble heart. good-night, sweet prince; and flights of angels sing thee to thy rest." ryan north: "shakespeare was a famous writer guy"